Thirsty for some tech news? We've got you covered, courtesy of our friends at TechRadar: find out what's coming with the Samsung Galaxy S10, watch a fantastic Uncharted fan film, learn when you'll be able to get into a flying taxi, and bag yourself an Amazon Prime deal. Amazon Prime Day is still running and will be until the end of today (Tuesday 17th July), and that means you can still pick up some fantastic bargains on all kinds of gadgets and gizmos – get the full rundown at TechRadar, where you'll find deals split up into categories, as well as some highlights of the very best offers live on the Amazon site at the moment. In recent weeks we've seen a steady trickle of leaks about the Samsung Galaxy S10, even though it's not scheduled to launch until next year. The latest word on the Samsung street is that the S10 is going to use ultrasonic fingerprint scanning technology rather than the standard optical – but the bigger question is, will it be embedded into the front display? For a long time, fans of the Uncharted video game series have wanted to see Firefly's Nathan Fillion in a big screen adaptation. That doesn't appear as if it's going to happen, unfortunately, so a group of fans have put together a 15-minute short featuring the actor instead – and it's actually really good. You can check it out in full via the link below. Will we get flying cars or self-driving cars first? Or both? 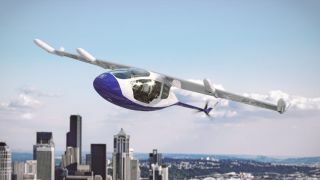 A new concept being shown off by Rolls-Royce sticks to the flying aspect, but the vertical take-off and landing (EVTOL) vehicle is electric too – the company says it would be able to get up to around 250 mph in the air and carry four or five passengers. We might even see it in action during the 2020s. Roku makes some brilliant little streaming dongles, and you'll also find its smart software on TVs. Now the company is branching out into wireless speakers as well, bringing higher quality audio to your home cinema setup. They're designed to work with Roku TVs, but support Bluetooth too, and can be had for a special early price of $149.99 (about £115).